The food grade gellan gum market report illustrates data analysis for 2018 (estimated) and forecast to 2026 (the forecast year), in terms of both volume in MT and sales revenue in US$. The food grade gellan gum market report comprises various forecast factors that impact the growth of the food grade gellan gum market. Market dynamics such as opportunities, drivers, trends and restraints have also been included in the food grade gellan gum market report. The drivers impacting the food grade gellan market include the increasing application of gellan gum in the food and beverage industry, rising awareness about health & wellness, which in turn drives the consumption of natural extracts and organic products, and growth in the consumption of convenience food by consumers. The major restraint in the food grade gellan gum market is high cost associated with food grade gellan gum and the availability of various substitutes for food grade gellan gum. The expanding applications of food grade gellan gum and rising awareness regarding food grade gellan gum among local producers are expected to create opportunities for the growth of the market. The major trends governing the food grade gellan gum market include the rising popularity of organic food products and increasing consumer awareness regarding the food additives added to food products. We have also included an outlook for the global food and beverage industry, the major trends influencing the food and beverage industry, global trends in the food and beverage sector, an overview of the food additives industry and perceived health benefits of food grade gellan gum. The report also comprises a strategic overview, followed by the value chain analysis and key information on the prominent players operating in the global food grade gellan gum market along with a detailed competitive analysis. This information will give a detail overview of the food grade gellan gum market to the reader. The food grade gellan gum market report also includes a market attractiveness analysis by product type, application, end use and region/country along with market structure and a detailed comparison between multinational players and regional players in the food grade gellan gum market. During the study of the food grade gellan gum market, our analysts observed that food grade gellan gum is largely preferred by manufacturers of food products such as bakery, dairy, confectionery, convenience food and others. Food manufacturers engaged in the manufacturing of food thickening agents, emulsifiers, stabilizers, binders, coating agents, texturizers and others account for a significant share in the consumption of food grade gellan gum. Food grade gellan gum is used as a food stabilizer, binding agent, texturizing agent and thickener. The report states that food grade gellan gum finds large-scale application as a gelling agent, as compared to its other applications as a thickener, a stabilizer, an emulsifier, a coating agent and a texturizing agent. This disparity in application can be attributed to the increasing demand for gelling agents in confectionaries. By product type, the low acyl food grade gellan gum segment is expected to hold a significant market share as compared to any other product type in the food grade gellan gum market. On the basis of end use, confectionery manufacturers account for high consumption of food grade gellan gum, owing to the increasing demand for gelling agents. 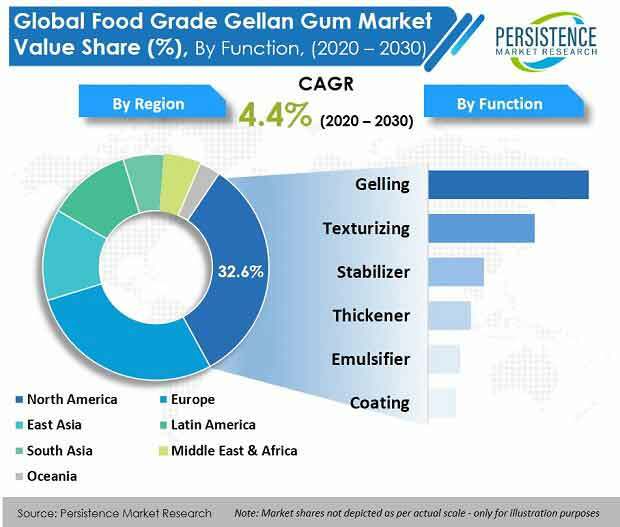 On the basis of region, North America, followed by Europe, accounts for a prominent market share in terms of value, which can be attributed to the growing awareness regarding food grade gellan gum products by consumers. APAC and Latin America are expected to follow North America and Europe account for significant value shares in the global food grade gellan gum market during the forecast period. The report also presents detailed competition landscape of prominent food grade gellan gum manufacturers and the revenue generated by these companies across the five regions – Latin America, North America, APAC (Asia-Pacific), Europe and MEA (Middle Eastern and Africa). To evaluate the market size some of the key parameters referred were revenue of food grade gellan gum manufacturers, production capacity, the average price of food grade gellan gum was obtained from various suppliers, manufacturers, distributors, and exporters through quotes, food hydrocolloid industry, market for substitites of food grade gellan gum. The key application segment of food grade gellan gum was considered and the dynamic ones were projected on the basis of feedback from different secondary sources and primary respondents. Data points were collected therefrom and considered for the modelling approach, which includes the overview of confectionery manufacturers, overview of the hydrocolloids industry, outlook of the food and beverage industry, and the average purchase price of food grade gellan gum. Assuming the currency rates remain constant during the forecast period, the food grade gellan gum market value and volume were estimated. The food grade gellan gum market report also includes additional information such as opportunity pockets for the manufacturers of food grade gellan gum, global economic outlook, perceived health benefits of food grade gellan gum, key regulations in various regions, major trends in the food and beverage industry, an outlook of the food additives industry, forecast factors, and recent developments in the food grade gellan gum market. Various primary and secondary sources were consulted during the course of the study. The secondary sources include annual reports of key industry stakeholders, recent publications, Factiva and Hoovers. The report also includes a detailed pricing analysis on the basis of product type for every region and the trade scenario of food grade gellan gum. A comprehensive competition analysis of the major companies in the food grade gellan gum market has also been provided in the report. This will help readers evaluate the long-term and the short-term strategies, various product offerings and recent developments in the food grade gellan gum marketplace. Some of the key players analyzed in the food grade gellan gum market report are CP Kelco, DowDuPont Inc., Cargill, Inc., Ingredion Inc., Hawkins Watts, Fufeng Group, Koninklijke DSM N.V., Dancheng Caixin Sugar Industry Co. Ltd., Zhejiang Tech-Way Biochemical Co., Ltd., Hangzhou Gellan Solutions Biotec Co., Ltd., Hebei Xinhe Biochemical Co., Ltd. and Meron Group. Food grade gellan gum is a type of hydrocolloid derived from a microbial source. It falls under the category of microbial source hydrocolloids and is a water soluble polysaccharide produced from bacteria, a species named Sphingomonas Elodea. Food grade gellan gum was initially used as a substitute for gelling agents at a low-use level in order to replace agar in the culture media, which is used to grow various microorganisms. Later, the usage of food grade gellan gum expanded to include food products as food additives. Food grade gellan gum is widely used as an emulsifier, a thickener and a stabilizer. It is also used as a substitute for gelatin in the manufacturing of vegan candies and confectioneries. Food grade gellan gum is also used in plant-based milk products, and is listed as an ingredient in soy milk. When properly hydrated, food grade gellan gum can be used in ice creams and appears as a fluid gel while churning. The demand for food grade gellan gum is relatively high when compared with any other gums as it acts as a natural texturizer in confectionery and bakery industries. Food grade gellan gum poses no harm when consumed, unlike the synthetic gum products. Food grade gellan gum is also used as an emulsifier in the food and beverage industry for various food products. It is useful in stabilizing beverages in order to avoid precipitation and permit the dispersion of oil into water. Food grade gellan gum is an essential ingredient for beverages and is stable in low pH environments. It also shows low viscous properties in liquids such as water without changing the texture and flavor of the beverage. These are some of the advantages that encourage key players in the overall food and beverage industry to opt for food grade gellan gum in various food products. Recently, the consumer preference for food products with natural ingredients and organic processing is a major trend among manufacturers and consumers in the global food and beverage industry. Attributing to the rising prevalence of this trend, there has been an increase in the number of manufacturers focusing on procuring raw materials and food ingredients that are processed under suitable conditions. In order to produce organic products the company has to adopt certain processes such as cleaning, sorting, and grading. In March 2017, CP Kelco, a major producer of specialty hydrocolloids, expanded its production facilities in Okmulgee, Oklahoma in order to produce KELCOGEL gellan gum and organic food grade gellan gum. This expansion helped the company meet the growing demand for organic food products among food and beverage manufacturers. Manufacturers of food grade gellan gum have an opportunity to explore new applications of food grade gellan gum. Various product innovations in the food and beverage industry and the distinct properties of food grade gellan gum are expected to boost the growth of the food grade gellan gum market. Currently, the usage of polymerizing agents in new fields such as microbiology and biotechnology has grown rapidly. Attributing to the biochemical properties of food grade gellan gum, it has good market potential in the life science R&D sector. Consumer awareness regarding food additives is low in countries such as Japan, but with rapid globalization, awareness has been increasing across several regions. Consumers now seek food products with natural ingredients. According to a survey conducted by Alland & Roberts, a gum manufacturer, around 88% of Americans are aware of the food additives listed on food labels. Similarly, in the U.K., 65% of consumers are aware of food additive enlistment. The increased usage of food grade gellan gum in various ready-to-mix and eat products such as dessert mixes, curries and bakery products. The gelling, binding and thickening ability of food grade gellan gum varies according to the ratio of amylose and amylopectin. Various other techniques allow for these ratios to be tweaked according to requirement. Thus, food grade gellan gum finds applications in convenience food products. Dancheng Caixin Sugar Industry Co. Ltd.
Zhejiang Tech-Way Biochemical Co., Ltd.
Hebei Xinhe Biochemical Co., Ltd.